Or Passed Graduation with 60% Marks or Passed Graduation ad NCC 'B' Certificate and Ability to Speak in Hindi, English and Conversant with Local Language. 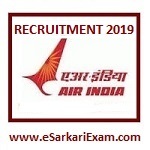 Eligible Candidates can Submit Air India Security Supervisor 2019 Application to the Official Address Latest by 19th April 2019. Open Alliance Air Security Supervisor Recruitment Advertisement Link. Download and Print Application Format. Send Application to the Address : Alliance Air, Personnel Department, Alliance Bhawan, Domestic Terminal- 1, I.G.I Airport , New Delhi- 110037 Latest by 19th April 2019 by Speed Post/Courier/Post.